Joyful Rant: Parties and Presents! The summer months mark many milestones in my family. Six birthdays, Father's Day and my parent's wedding anniversary occur from June to August, and because these months are so busy we've formed a habit of coming together in August to celebrate them all at once. This year my sister, Ali, the youngest of my siblings, turned 40. As surprised as I was to actually turn 40 several years ago myself, it's totally crazy that my baby sister has rounded that corner as well. 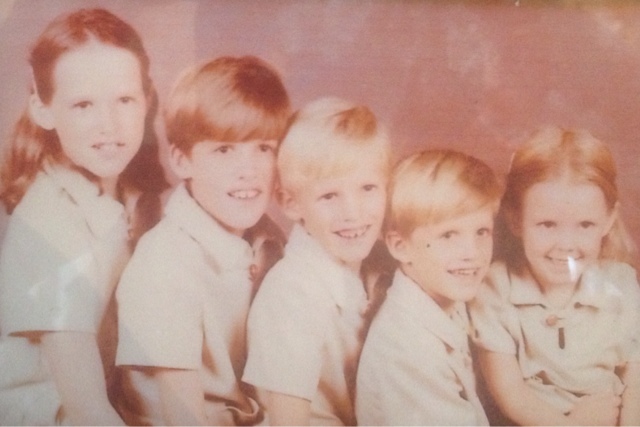 One of the most frequently reproduced pictures from our childhood is of my 4 sibs and I dressed in outfits our mother made for us at the ages of 2, 4, 6, 8, and 10. It is almost inconceivable to me that this picture was taken almost 40 years ago. Thankfully, however, we have something to help make up for all the unwanted aging we have had to do over the years - Parties and Presents! I have always appreciated any excuse for a party- I am an absolute holiday junkie - and in a large family, birthdays are a frequent excuse to celebrate. And truly, who doesn't feel good when they get a present? Presents are just pure fun, and they satisfy that need in all of us to open Pandora's box. 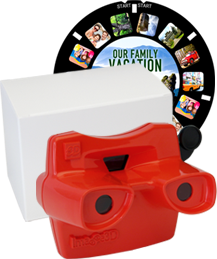 It was tough to keep my dad's Father's Day under wraps since June because we think it is a pretty awesome gift idea: A customized View-Master (remember those?) of pictures of my dad with various members of our family that Lacey and Zoe picked out and created for Father's day. The View Master itself - available in several colors, as well as the initial reel, was $29.95, and it was pretty easy to upload the pictures to the website. It was a big hit at the party and got passed around to each guest to enjoy! I love the idea so much that I ended up buying several additional reels for others. If you love pictures, check it out! This is a present everyone is loving.